I'm going to take a bit of time out today and write about something else before continuing with my high dose. Today I'm going to write about how my then girlfriend, Sarah, helped me. 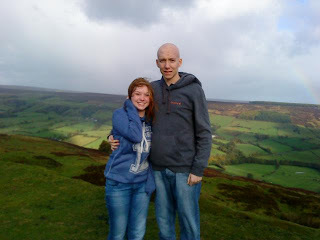 Sarah and I at Rosedale, North Yorkshire. Sarah was 16 at the time of my diagnosis and although she lived 200 miles away from me we had been together a year and a half. When I had to tell her three weeks before her 17th birthday, that I had cancer and that I might be dying I felt like my life was collapsing. I don't imagine it's ever easy to tell someone, but to tell someone at such a young age was something I wish I'd never had to do. I never want to hear anyone cry like she did the first time I told her, it was so awful for me to hear. I felt so awful for being the cause of her pain. I was so terrified of dying and I had no idea what I'd do if I was. Sarah would always be the one who I spoke to about this, no matter what time. I honestly can't remember the amount of times I rang her at 3am so upset and worried about dying. She was always there for me. 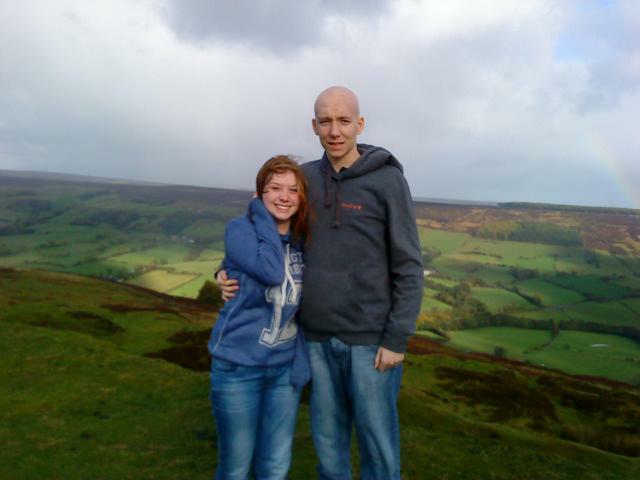 When I lost my hair in hospital and she saw what I looked like bald, she cried so much but she was always there to support me when I needed it. She was one of the only people to see me when my face was covered in spots and she tried her best to make me feel better about it, although I still thought I looked like the creature from the black lagoon! Sarah and I again (well in my mind anyway). She was a constant support and helped me all the way, even to the detriment of her AS levels, which she is now resitting along with me! We spent New Year together and she came to see me at every available opportunity. When she wasn't able to visit because of work or sixth form we would spent quite literally hours on the phone everyday, and I knew I could (and still can) talk to her about absolutely anything that was worrying me. Sarah also has custody of my sperm, meaning that in the event of my death she would be able to use it to have my children, meaning that even if I die I can still have children. I've always found the idea of this slightly strange but also quite interesting. How many other people can claim to maintain the ability to have kids after they've died? I would've done anything to have spared Sarah from having to go through everything with me, I even considered leaving her when I was diagnosed so she didn't have to. But she said she wanted to help me as much as possible. In many ways it was even worse for her than it was for me. I had charities such as Teenage Cancer Trust there to support me but there isn't anyone to support partners of cancer patients, except for their families and friends. This often means a lot of pressure is on the girlfriend/boyfriend/husband/wife and they often need someone to turn to themselves. I'd like to say thank you to Sarah's friends and family for supporting her support me. I'd also like to say thank you to one last person. Sarah. She cared for me and told me everything would be okay, even though she sometimes didn't believe it herself. I'll always be grateful to her and she's still the person I fall back on for everything. I'd be completely lost without her. that was so touching...I only know Sarah's mom, but she is so amazing and helped me through a really tough time so it's good to know that her compassion is hereditary!! I had my baby girl 4 days after my mom died of lung cancer and Frances was so amazing and supportive I'll never forget it...keep up with the blog, Nick, I'm addicted!